Renewable natural gas for heavy-duty vehicles (HDVs): Why not? Why use renewable natural gas for heavy-duty vehicles or develop RNG or LNG fueling stations in Canada and USA? Is it profitable, technologically advantageous and environmentally friendly compared to electric vehicles? Here is an overview of the market, its catalysts, subsidies and government policies supporting RNG for heavy transport. Reducing CO2 emissions of heavy-duty vehicles (trucks, buses, garbage trucks, municipal fleets, and others) has been a government concern in recent months. In November 2018, the United States announced the Cleaner Trucks Initiative, a policy to reduce nitrogen oxide (NOx) emissions and tighten emissions standards for HDVs. In December, the European Union suggested a target of 30% of GHG emissions decrease by 2030. Governments are therefore already to meet their GHG emissions targets and to create beneficial conditions for cities, businesses, organizations, and others. Converting heavy-duty vehicles to renewable natural gas can be profitable for fleet owners as a zero or near-zero emissions technology for HDVs. According to the California Air Resources Board, RNG has the lowest carbon footprint for its life cycle, from production to use. Converting HDVs to renewable natural gas will reduce CO2 emissions and pollution in the transportations sector, which plays an important part in climate change. Indeed, in the United States, heavy-duty vehicles generate 20% of CO2 emissions of transportation industry even if they are responsible for only 5% of road traffic. In Canada, it accounts for 9% of total emissions. It has the lowest carbon intensity (CI), as shown below. CI measures the amount of carbon emitted by a fuel. 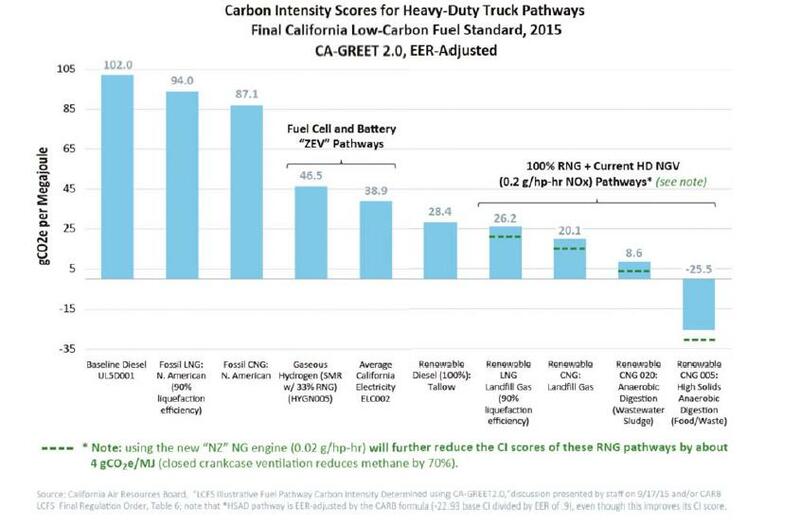 For example, if heavy-duty trucks uses RNG generated from a landfill gas, it produces 75% less carbon than diesel. The decrease amounts for 125% if RNG comes from anaerobic digestion of waste, making it a negative carbon production. Renewable natural gas can generate up to 90% less emissions of nitrogen oxides (NOx), which are responsible for air pollution. Renewable natural gas for heavy-duty vehicles uses technology that is already commercially available on a large scale. It is the only one of its kind that can meet today’s cost, CO2 emissions reduction, performance and infrastructure requirements in the USA. More than 65,000 HDVs were running on natural gas (NGV) in the United States in 2016. Some of them mix renewable natural gas with natural gas. Several infrastructures needed for the deployment of RNG already exist in the country, reducing the costs of its implementation in comparison with heavy-duty electric vehicles. Renewable natural gas is particularly advantageous for heavy-duty trucks traveling long distances and urban vehicles, such as buses or garbage trucks. 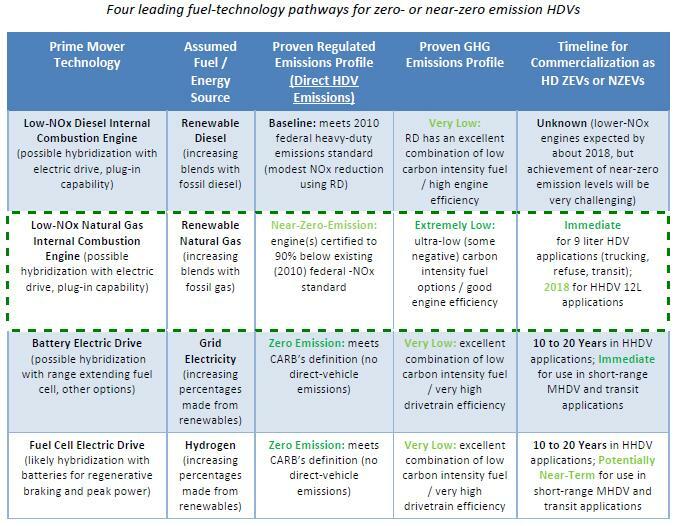 The following table compares the 4 fuel-technology pathways for zero or near-zero emissions heavy-duty vehicles. They encourage the adoption of zero or near-zero emission technologies for heavy-duty transport. It is also a way of reducing the capital investment for fleet owners. Of course, the presence of infrastructures such as CNG or LNG stations will determine the success of the implementation of RNG HDVs. According to a 2013 study, access to 50,000 compressed natural gas service stations and 3,000 liquefied natural gas service stations in the United States would be needed to get there. According to NGV America, there are more than 1,600 stations for compressed natural gas and 140 for liquefied natural gas. In recent years, the Canadian government has been supporting converting heavy-duty vehicles to RNG and to alternative fuels through a number of policies. In December 2018, the Canadian government released the Clean Fuel Standard design document, setting the stage for the final regulation. The standard aims to promote the use of fuels, energy sources and low-carbon technologies. The goal is to reduce carbon intensity of liquid fuels by 10 g of CO2 equivalent per MJ, or about 11%. The standard will also generate credits for companies replacing fuels with clean technologies, such as RNG. Consult the Canadian Government’s Clean Fuels Standard Design Document for more information. This regulation aims to reduce CO2 emissions from heavy-duty vehicles, such as school buses, coaches, trucks, and others. Announced in 2018, it will only come into force in 2020. It will help businesses save more than Can$ 19.4 billion in fuel by 2030. 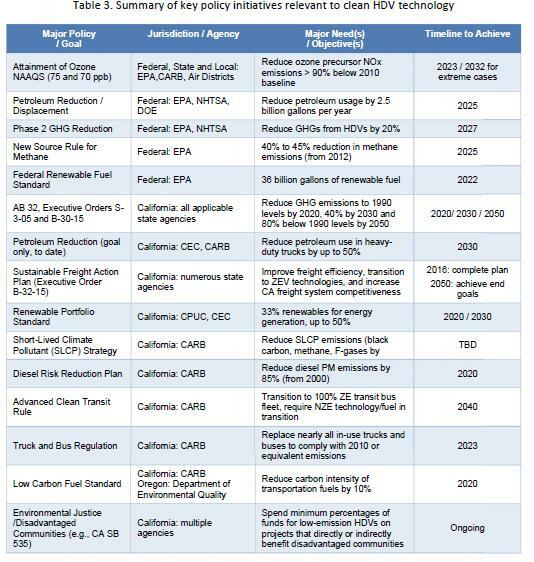 Over the years, CO2 emissions standards for heavy-duty vehicles will become more stringent and will require, in 2027, a reduction of 25%. Read more about this Canada’s Heavy Vehicle Regulations. The Canadian government plans to encourage businesses to develop and adopt lower carbon technologies through the carbon tax. It will add this tax to fossil fuels and increase it each year. A second component will impose limits on CO2 emissions for companies. If companies succeed in staying below them, they will get credits that they can sell. If not, companies will have to pay more. Learn more about the Canadian government’s price on carbon. In United States, the federal government is implementing several policies to support the use of renewable natural gas for heavy-duty vehicles or the use of zero and near-zero emissions technologies. In February 2018, the United States announced the extension of tax credits for vehicle owners running on biodiesel, renewable diesel, electricity and for second-generation biofuels producers. Businesses can benefit from a $0.50 per gallon credit for commercial use of natural gas, renewable natural gas and other alternative fuels. Project developers can also benefit from a tax credit for the installation of CNG station infrastructure up to 30% of the amount. Read this article to learn more about the extension of Alternative Fuels Tax Credit. Managed by the Environmental Protection Agency (EPA), this policy imposes biofuel volumes to the transportation sector. These biofuels fall into four categories: cellulosic biofuels, diesel produced from biomass, advanced biofuels and renewable fuels. This table shows the rates imposed by the RFS between 2017 and 2020 in million gallons or billions of gallons. Read more on the EPA website. The following table summarizes other key policies at the country and state levels. The US government offers numerous grants and financial incentives to encourage the adoption of zero or near-zero emission technologies, including renewable natural gas, in HDVs. In addition, some states also provide such financial assistance, including California, New York, and Ohio. Check out the NGV America’s website to find out more. This program provides funding to projects developers working in fields related to transportations, CO2 emissions reduction, and road traffic. Since 2015, more than $ 30 billion has funded more than 30,000 state, city, and other projects. Several selected projects were, among others, about alternative fuels and related infrastructure. Visit the U.S Department of Transportations page for more information on CMAQ. Managed by the EPA, this fund helps owners of heavy-duty fleets, among other things, to replace their diesel vehicles with cleaner technologies. It also supports them in converting heavy-duty vehicles to alternative fuels such as renewable natural gas. Available funding is equal to $ 40 million available for school districts, municipalities, cities and more. Take a look at the EPA website to learn more about Clean Diesel and DERA Funding. This program is managed by the Federal Transit Agency (FTA) and aims to fund clean transportation projects for cities buses. Check out the FTA website for more information on the Clean Fuels Grant Program. Experts in renewable natural gas for heavy-duty vehicles are here to help! There is no longer any doubt: the use of renewable natural gas for heavy-duty vehicles will be part of our near future. This sector has a great potential that developers of North American projects or those wishing to enter this market would benefit from. Do you need the right suppliers or valuable tips for your project? ANGI is a supplier of compression and refueling equipment for natural gas for vehicles. He designs and manufactures distribution units, fuel management systems, control systems, and compressors. Located in Quebec, EBI is responsible for evaluating the feasibility and profitability of your project, provides compressed natural gas vehicles and offers public service stations. US Gain supplies CNG and GNR vehicle fleets through its network of service stations. They offer a reliable partnership, high-quality equipment and a team that can listen to technical problems that may arise. Check out our supplier catalog to find more companies.